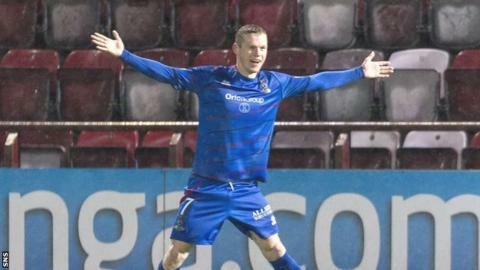 John Hughes celebrated his first win as Inverness CT manager and praised former boss Terry Butcher for easing his transition into the role. Two second-half goals by Billy McKay to keep them second in the Scottish Premiership table. "There are no egos in that dressing room," Hughes told BBC Scotland. "Terry has put in the values and the fundamentals and we go and play off those values." The former Hibernian manager added: "Everybody rolls their sleeves up. If we lose that we'll get our backside kicked. "These guys train like their lives depend on it. We were playing young v old on Friday and they were kicking lumps out each other. "The will to win is something special. "That's all down to Terry and that's made my job very easy. "They are a special bunch. I am not saying we are going to win every match but everybody that we play against will know they have been in a game. "That's five clean sheets. Everybody is playing their part and I am absolutely delighted for them." Hughes believes Caley Thistle are second in the table "on merit" and claims that the players plan to enjoy their lofty position. And the new manager, whose debut in charge was marked by acknowledged that he is benefiting from the squad trying to impress him following the departure of Butcher to Hibernian. "You just let it happen if guys are out there trying to impress the gaffer," he said. "Marley Watkins was very good going up that right-hand side. He's a real handful and a lovely kid." McKay's brace took his tally to 15 goals this season. "He's a special player," remarked Hughes. "If you look at his second goal, he plays on the shoulder of defenders, he got slotted in and [next thing] it's in the back of the net. "He's a very humble boy, which makes him special. "When you've got players like Billy in the team there's every chance you'll win the football match."